"I wanted a new challenge and to do something different. Becoming a Resident Voice has been a positive change for me and it is a role I am really enjoying." Having had vast experience in working with The Guinness Partnership Housing Association over the past ten years, this project was a fantastic opportunity to develop a fresh, new, flexible brand for ‘Residents Voice’ - a new proposition underpinning The Guinness Partnership's resident engagement structure. 'Residents Voice' was to be aimed at attracting a different type of resident to become actively involved with Guinness, in particular, young people who are computer literate and use social media, moving away from the stereotype of older residents. The 'Residents' Voice' brand we developed reflected the importance of individuals in making a difference - making their mark - and improving the area and community in which they live. The strapline 'Make your mark' was born. 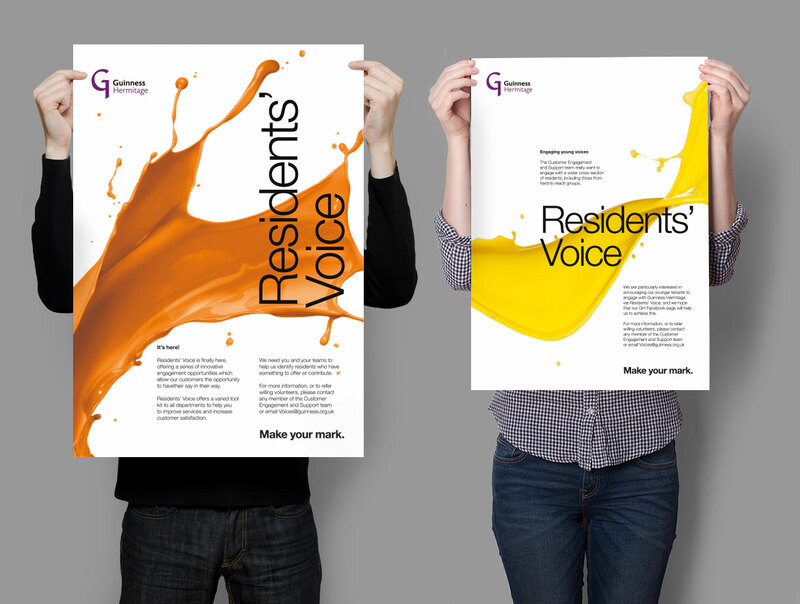 Illustrated by bright, dynamic, colourful paint splats, the Residents' Voice brand was going to get heard that was for sure. The paint splashes brought to life the 'make your mark' key phrase whilst the different colours helped signify the individuals involved in making a difference. To date, the Residents' Voice brand has been rolled out extensively online, across social media, and offline across brochures, advertisments and posters, and has already had a dramatic effect in recruiting a vast number of new residents to The Guinness Partnership engagement panel.